Yesterday I was helping a friend with a t-shirt quilt that would be a graduation gift for her son. 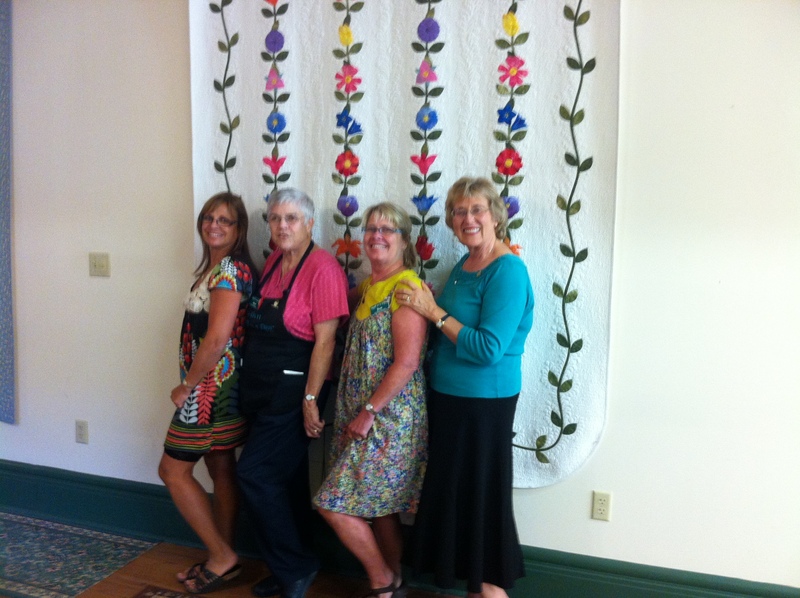 We decided that a few photos would make the quilt extra special and more personable. The quilt was already set to be assembled, so we decided that we would do a raw edge applique’ to create our desired look. 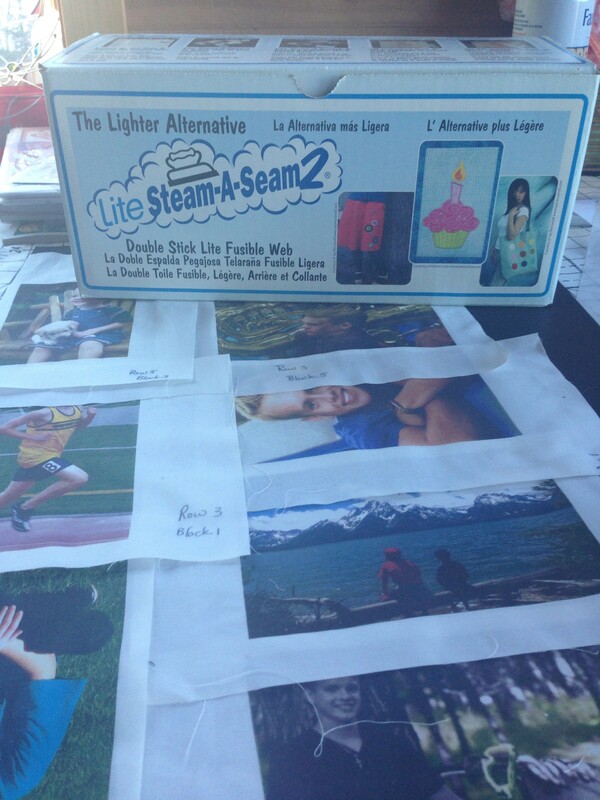 I used a product called EQ Printables. 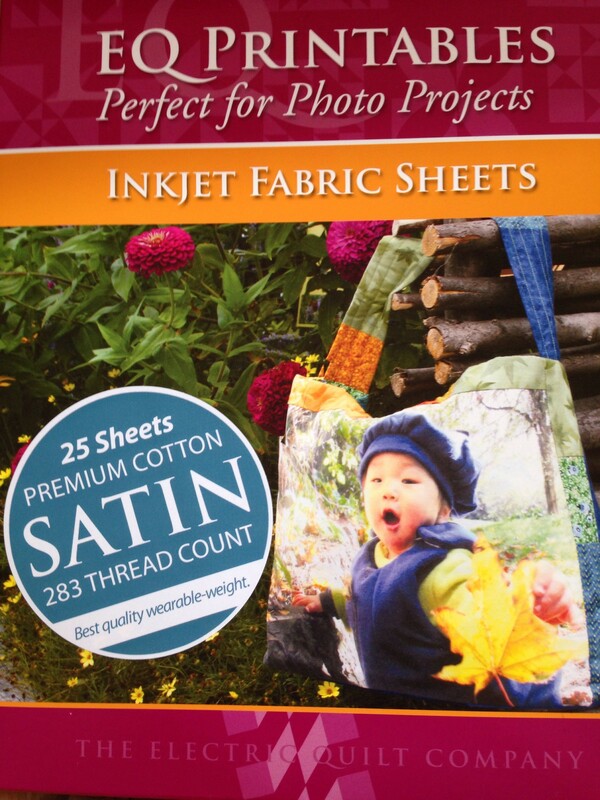 It is a wonderful product when used with an inkjet printer. I prefer to allow the ink to dry for several hours to a few days after printing. Always remember to remove the shiny backing before proceeding. I then heat set it with a cotton setting, no steam. It is a good idea to then soak in cool water to remove an excess ink. Blot dry and heat set one last time, this step will also finish the drying process. 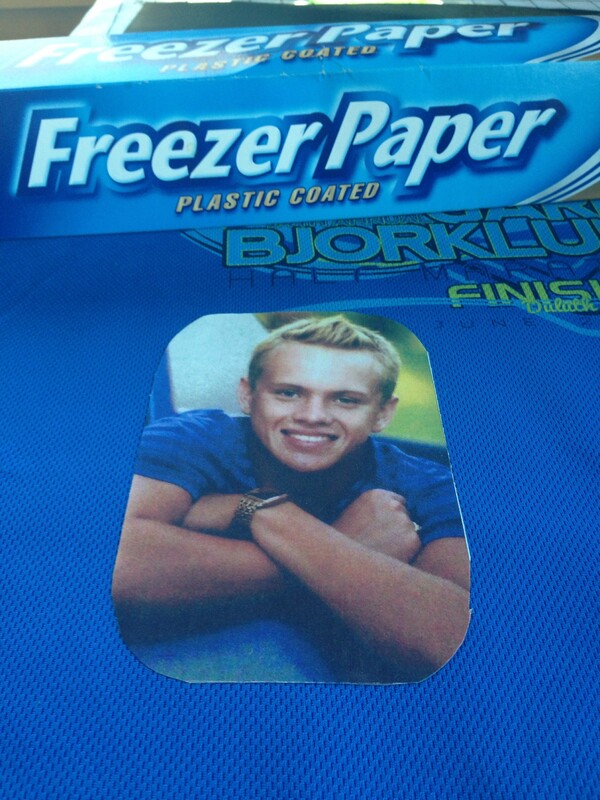 Your photo is now ready to be applied on to a t-shirt. Steam a seam lite 2 is a really great product to position your applique’ shape. I like it because it is double-sided and you can easily reposition your applique’ before you set it with the iron. It has a paper side that is easy release. 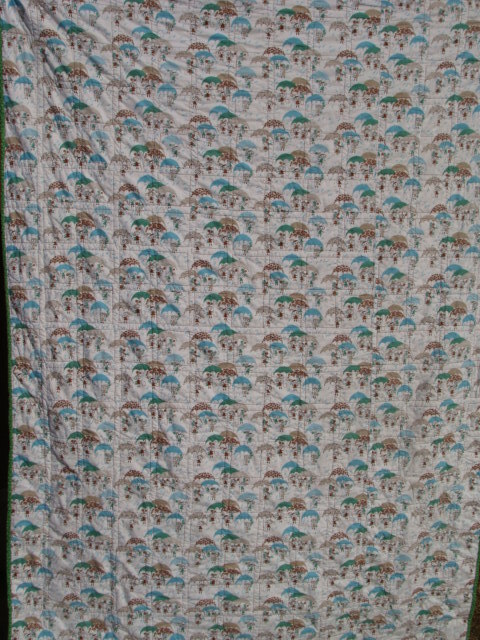 this is the side that you would iron on to your photo or fabric that you choose to applique your project with. I have a few photos, so I am going to try to fit them all on one piece. I pressed them on to the steam a seam with my iron. The non release side is perfect for tracing your shape of applique. 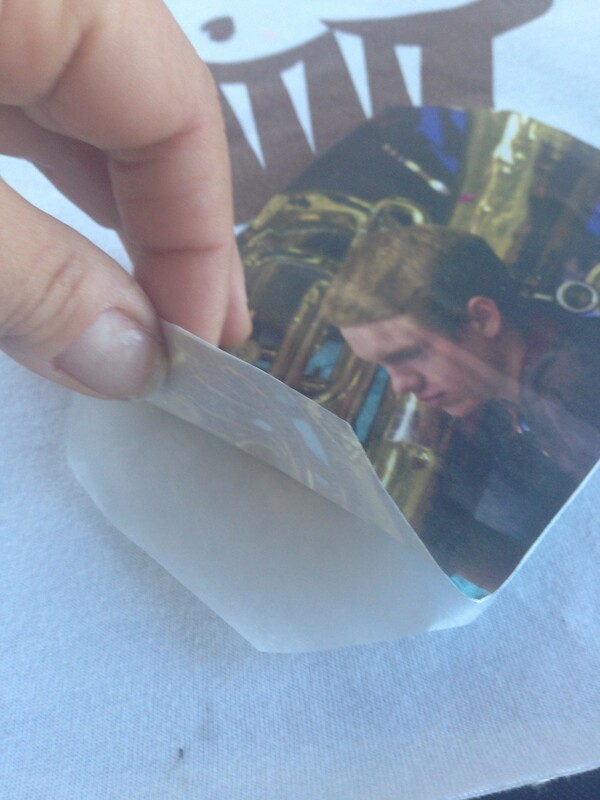 This is also the side that once the paper is removed, allows for repositioning of shape or, in this case, photo. 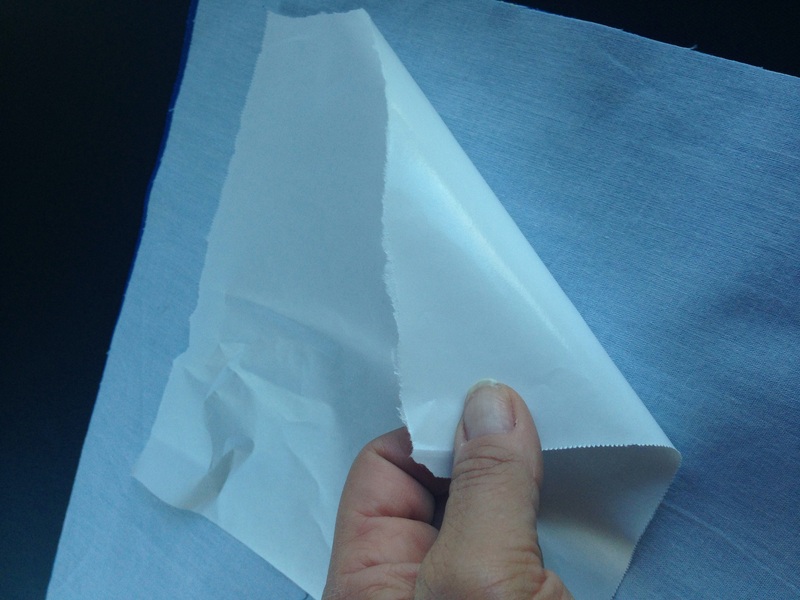 It is important to note that the paper should not be removed until the fabric or project is pressed on to the steam a seam. I cut all the photos apart and am ready to press on the t-shirts. Remove the paper backing and position and reposition to your hearts desire. once you have the desired positioning you will press in place. and we are ready for a little raw edge applique’. 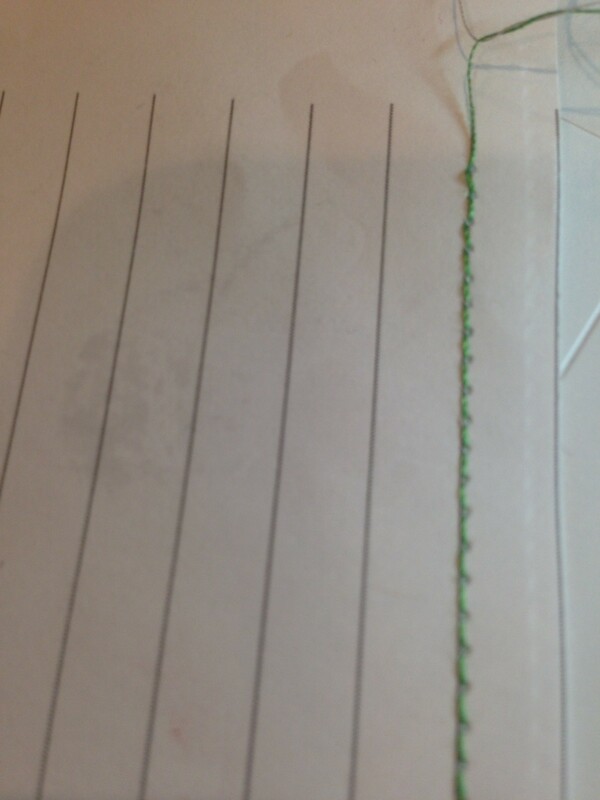 The reason it is called raw edge applique’, is because it is not a finished edge. It is not folded under, nor is it hemmed in any way. We are applying it with a product that adheres it to a desired canvas, and will be stabilized with a decorative stitch to secure to surface. There are so many decorative stitches, too many to list all. The most popular are the zig zag and the blanket stitch. If I were doing a wall hanging it would not be out of the question to not stitch at all, there is no need to because it wouldn’t be washed. There is little chance that a wall hanging would leave the fabric. If for any reason it did, you could merely press it back down with an iron. Because this quilt will likely be washed many times, but likely not as often as it should ( it is being given to a college student), it is extremely important to stitch it in place. Before I stitch my shape into place, I always iron a stabilizer on the back of fabric. 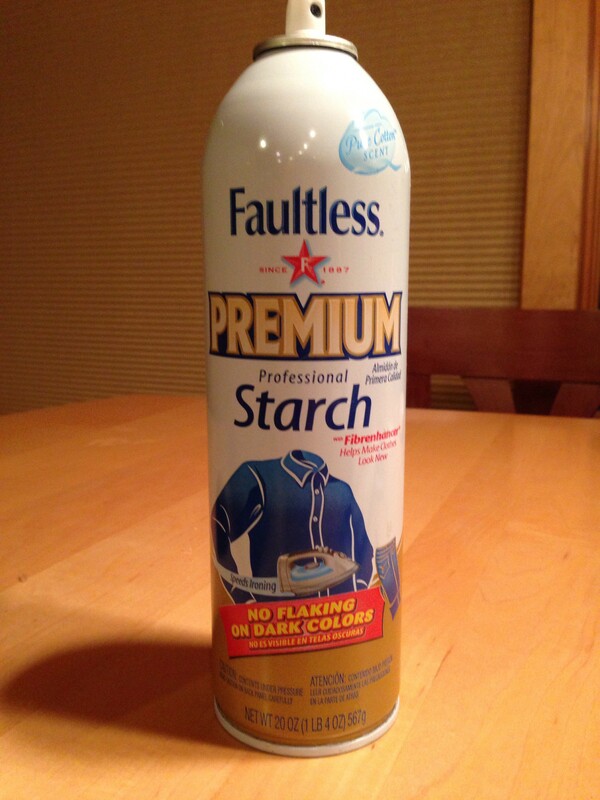 This prevents puckering and distortion of fabric and applique’. If I don’t have a tear away stabilizer on hand, I will also use freezer paper. I iron the shiny side of the freezer paper to the back side of my project. 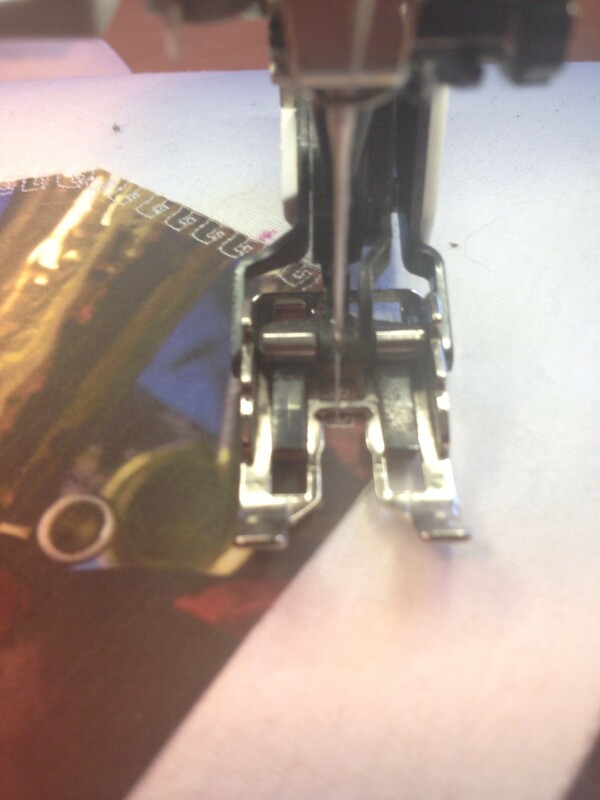 It tears away easily after the piece is completed. It is important to be certain where you want the decorative stitching to lay on the project. It’s a good idea to decide if you want the design to overlap the applique or follow the edge of your applique. 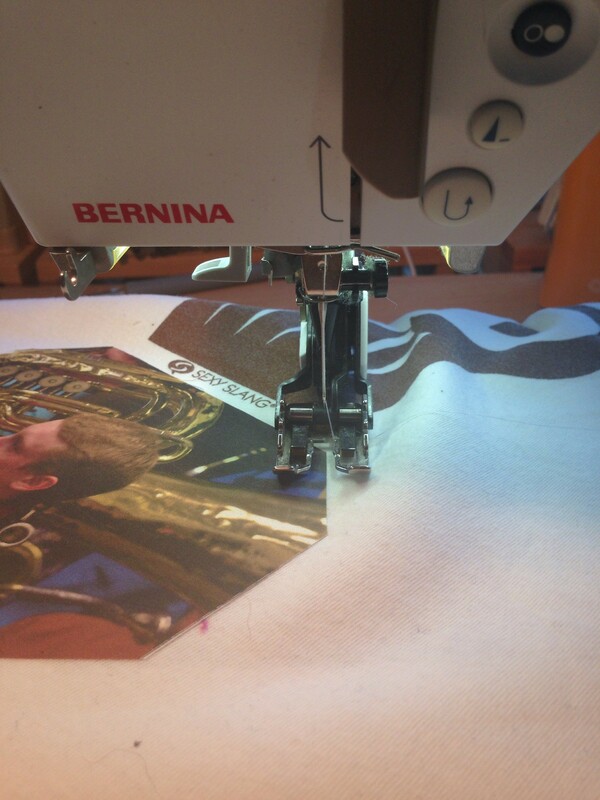 on my example I followed the edge, I did not want it to overlap on the t-shirt because I like using the decorative stitch as a frame when I use photos. I also try to find a decorative stitch that fits the design of the project I am working on. I tried using masculine motifs for this project. I would love to hear about some of your methods, we are never so experienced that we can’t learn from one another. Have a Happy Weekend and Quilt on my friends! 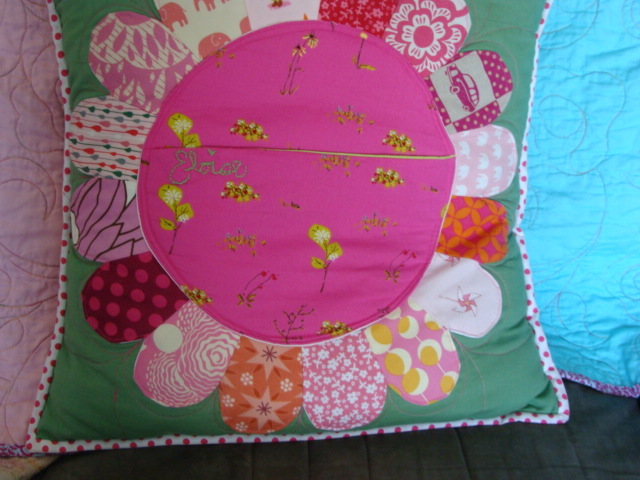 Recently, I have given lessons to many beginner quilters. 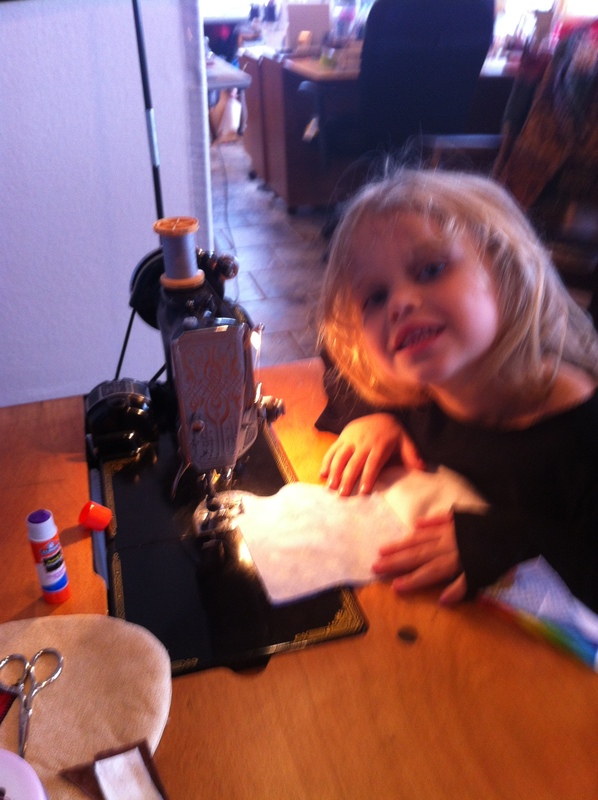 They begin by learning correct pressing techniques, the importance of precise and safe cutting with the rotary blade, the use of all the different tools, and why 1/4 inch seam? I always have to share when ever that last question comes up. 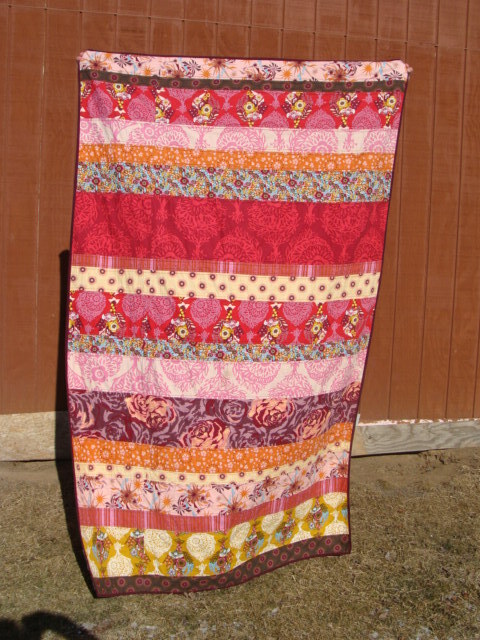 When I made my very first quilt, I was self-taught, and I made the quilt with 5/8 inch seams. Not only did it drastically reduce the size of my quilt, but it added much more bulk to the quilt than needed. LOL…(laugh out loud, not lots of love…thats another story.) I always teach how to read a pattern, the secret is one step at a time. 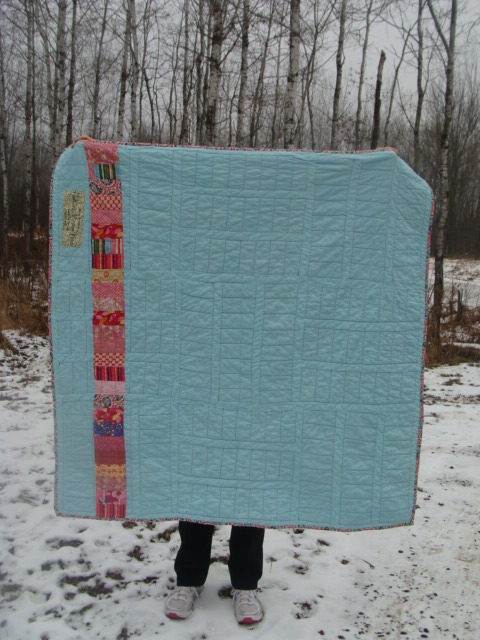 So often, we read the entire quilt pattern and then become completely frazzled and overwhelmed. I don’t want you to think this is a bad idea, on the contrary, reading the entire pattern is a good idea. It gives you a sense of the direction you are going in making the quilt. The next step however is take one step at a time. When the last step is done, move on to the next. I also never cut my borders or sashing until my blocks are made. The reason behind this is, you don’t really know how big your blocks or your quilt will be until after it is together. I will be giving border and sashing instruction tomorrow, so check back for that info. Once we have completed all the above info, we have a new problem, where so we go for our patterns? I always suggest trying some free patterns before going out and buying books. 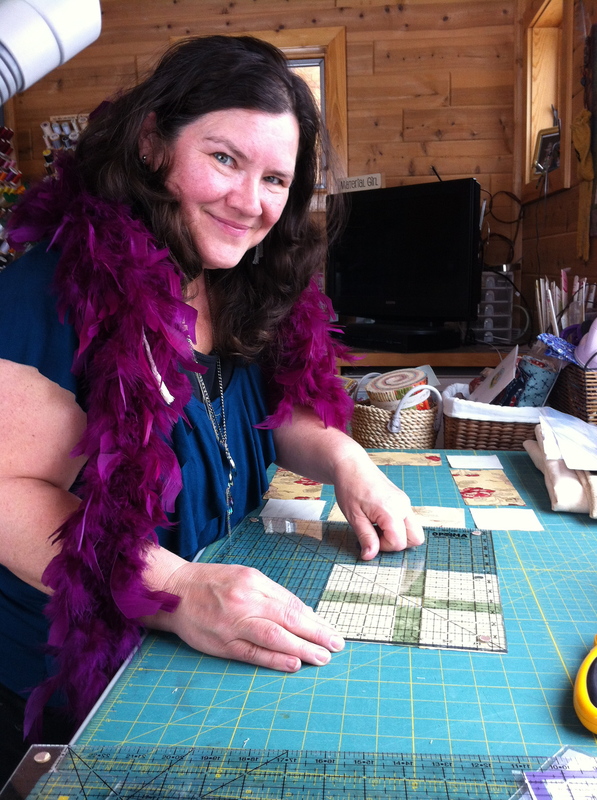 This way you will know the type of quilting you like before you invest. 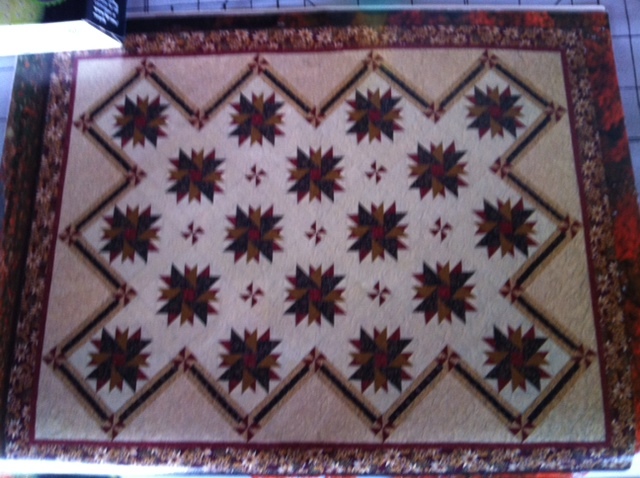 There are strip quilts, star quilts, applique quilts, quilt as you go quilts just to name a few. This way you may also be able to find out which designers you like as well. I find that Miss Eleanor Burns is one of the best designers for the beginner. Her patterns are simple and concise. There are illustrations that are in color, and she has different color ways for every pattern. This is helpful for those who have a difficult time imagining what a pattern would look like in color ways that aren’t displayed. If you are on facebook, you must like Eleanor Burns quilt in a day page. When you do, you will have access to a free Block of the month club (BOM) You can get backdated blocks and then you can take a photo of it and enter it in her monthly block drawing and win a prize. nifty isn’t it? Quilting on the Square, Quilt-Pro Block of the day ( they will email you a new block every day) there is a place called freequiltpatterns.com , and did you know that you can google various fabric companies and go to their sites and find free patterns? I hope this was info you valued. If you have any info you would like me to cover, leave a comment, its easy. go to the top right of the page and hit on the add comments, right below the services and tips and info tabs. Also you may want to subscribe, if you enter your email you will be notified of any new posts and info . You will also receive discounts when using my services. An elderly man was talking to his children about his last wishes. They asked his what type of service he would like. His reply was ” kids, I want you to cremate me and sprinkle me over moms favorite quilt store.” the kids were stunned, and then he finished. ” that way I will be sure she will visit me often.” 🙂 Have a great evening and remember, there are worse things than being called and old sew and sew. When I was a little girl, my daddy always made me feel so special. I remember when I was in 6th grade, it was our last day of school, he sent me my first roses. He sent them to me to celebrate my last day of elementary school and the beginning of the next journey his little girl would experience. He always loved me unconditionally and told me often that he loved me. He would take us to Sunday school classes and have us attend church, he would come on special holidays. When we got home from church he would have bacon and eggs waiting for us. 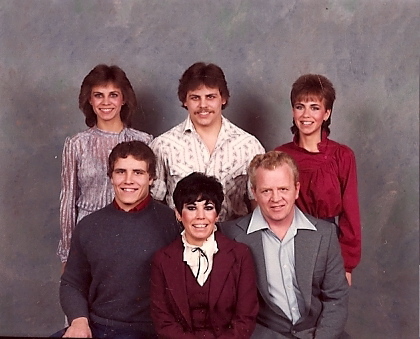 One of my favorite pictures is a church directory photo that was taken at United Protestant Church in Morgan Park. It reminds me of how close we were then and continue to be today. 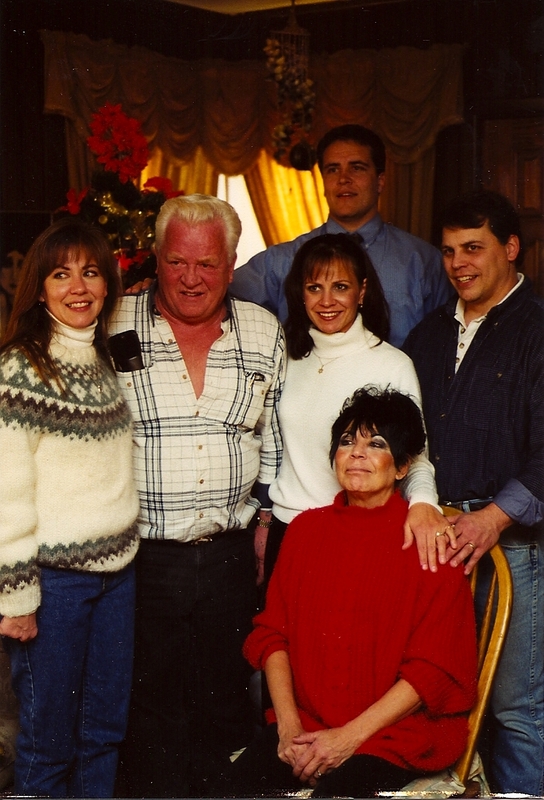 My father instilled in us a sense of family that we don’t often see today. We Love deeply and laugh constantly. Please, don’t get me wrong. We were not without our issues, there were arguments and misunderstandings. Stories that now bring a smile to our faces. I remember one winter when my brothers were suppose to be doing the dinner dishes, we alternated between the girls and boys. The boys were being boys, not doing what they were suppose to be doing. My dad reacted and threw a salt shaker at my youngest brother, he ducked. Good thing he did too, it would have hit him in the head and likely killed him….okay, maybe maimed him. Unfortunately it was January, subzero temperatures that year. When he ducked the salt shaker, it went through the kitchen window. I’ve never seen the look of fear and impending doom on a face before, but I sure did after that window broke. My brother was disciplined because he wasn’t hit….maybe more accurately because he didn’t stop it from going through the window. Please don’t think that my parents were abusive, times were different. This was a time when children respected their parents, whether it was right or wrong. After he repaired the window we went sledding at the Zoo. 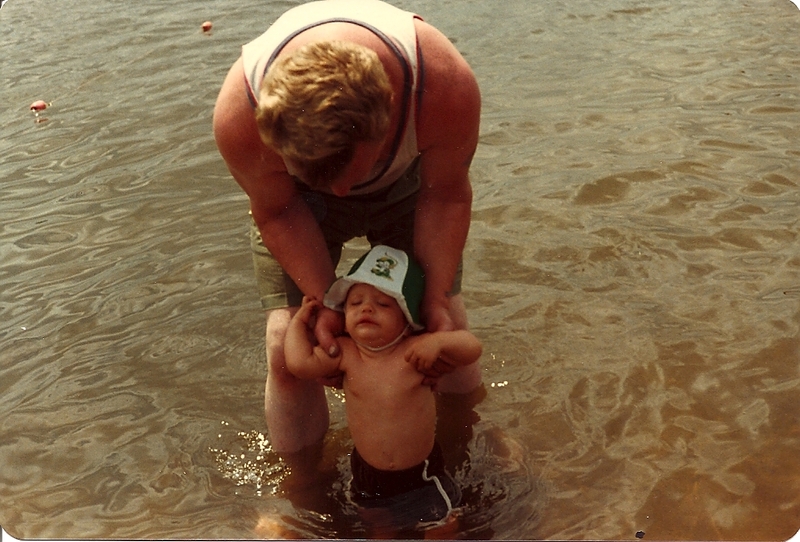 Dad would take us smelting in the spring, picnics at Chub Lake and on the North Shore of Lake Superior in the summer months, fireworks behind the Meirhoff building on the Bay in Canal Park. 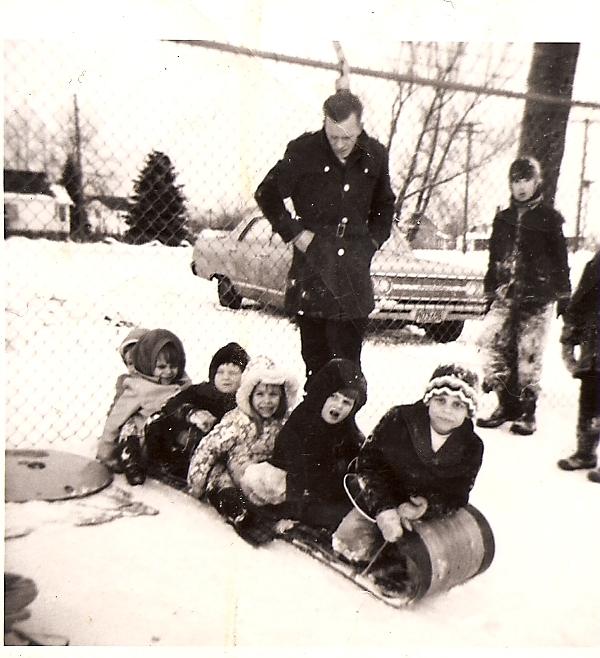 We didn’t have a cabin or extra money for trips, we did have opportunity to build lots of memories. Dad was always our advocate. We always knew that he would fight for us. He had a saying, “Always tell the truth, it only ever has to be told once because it is always the same.” The first movie he ever took us to was Bambie, all through our life he used a line from the movie to convict us. If he heard us talking about someone , he would say “Remember what thumper said? If you can’t say something nice, don’t say anything at all.” He taught us to be honest, our integrity was something no one could ever take from us. He seemed to get softer as we got older. On my wedding day I was standing outside the church door with him. He turned to me and said ” you don’t have to go through with this, we can turn and walk out that door right now.” I told him I had no reservations, he opened the door and we began our walk. I turned to look at him, he was sobbing as we walked down the isle. I was Daddy’s little girl and I always will be. Amazingly enough, he fell as in love with my husband as I did. No longer with reservations, but Dad was happy that Dave was who I chose to spend my life with. Actually, quite often he would take Dave’s side over mine…. guess it was the good old boys club. He certainly loved his grandchildren, they were everything to him. He had so many songs that he sang to each one of them. I love to hear them sing those same songs to their own children today. It was so obvious how he felt about each one of them, he said it with his eyes they just lit up when he was with them. Zachery was his first grandchild, they really had a special relationship. I am so thankful that I had a father who raised me to cherish people and not things, to give more than I take, and to treat others better than I deserve to be treated. He taught me so many things, but he didn’t teach me how to live without him. March 1, I remember my Daddy. It has been three years since I last heard him say “I Love You baby” , which by the way is the last words he said to me. 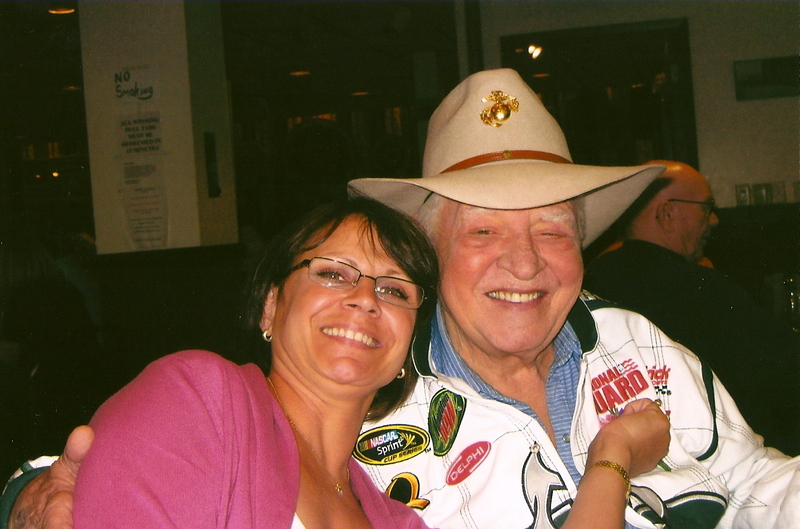 On the valentine’s day before he passed, he had purchased a necklace and a pair of earrings for mom, and two cards. He gave her the necklace and one of the cards. The year after he passed, I gave her the earrings and the second card. 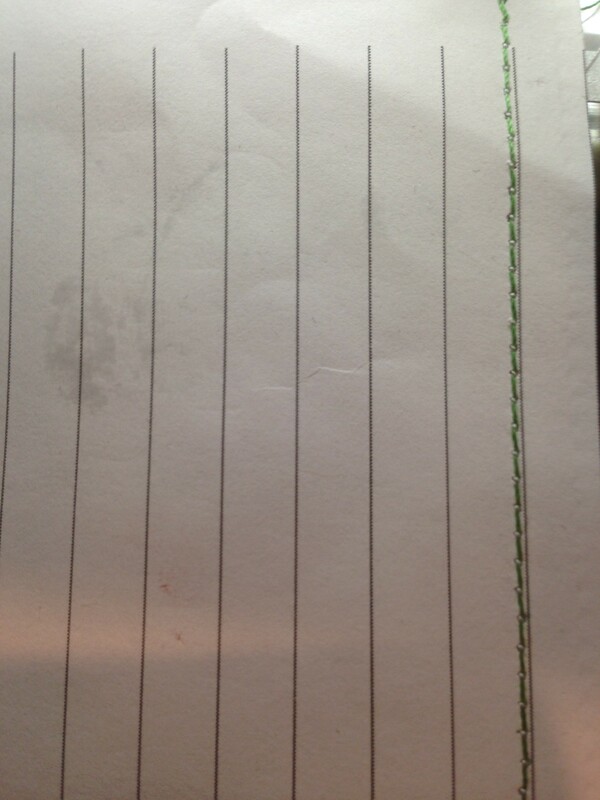 In the end, his handwriting had gotten difficult to read, what wasn’t difficult to read was “I will Love you Forever” . I thought this would be her last valentines gift from dad, she did as well. When my father passed away, I asked mom for his clothing. It took me nearly two years before I would know what to do with them. Just before Valentines Day before the second anniversary of his passing, I had a great idea. One last gift to mom from dad. I made mom a quilt out of his clothing. I did not wash them, I wanted his scent to still be on them. When I gave the quilt to her, she was consumed by emotions. All of the big stars are his favorite shirts. It was a gift of love and healing. I felt like I had an opportunity to visit with dad one more time as I constructed this quilt of love. 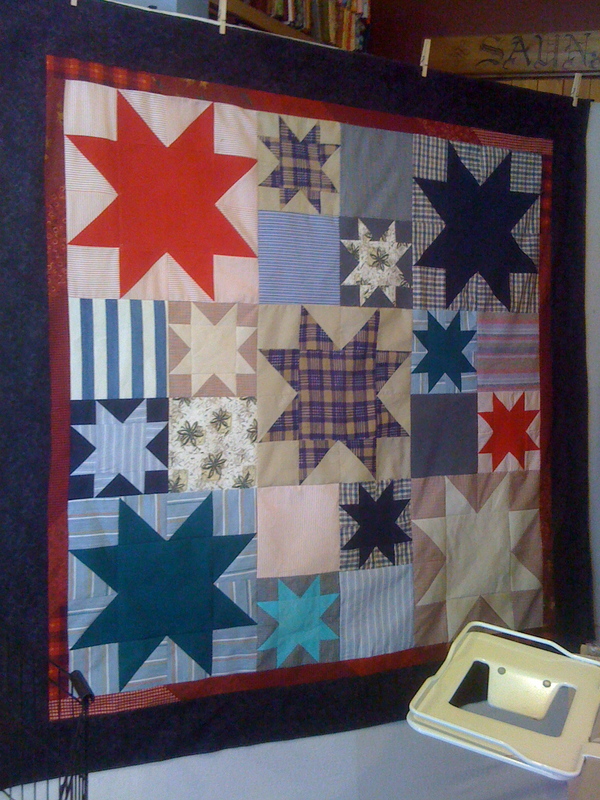 I have since made four additional quilts from his clothing. 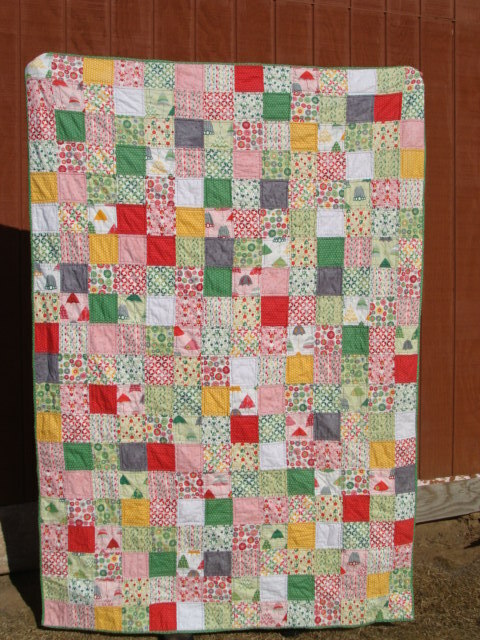 I made a quilt very similar to this one for my husband on our 25 wedding anniversary. 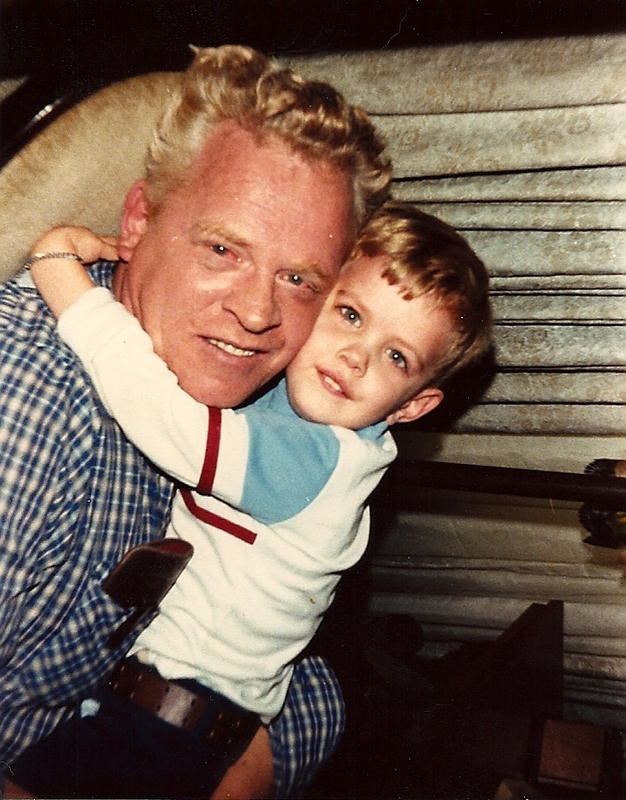 He was so touched, my dad had become a father to him. He misses him dearly. There isn’t a day that goes by where I don’t hear his wisdom, see his smile or hear that mischievous laughter. He was loved by all who knew him. He accepted you where you were, and was a true and loyal friend. One of the Raleigh Street boys. I will post a few more photos, just for fun. 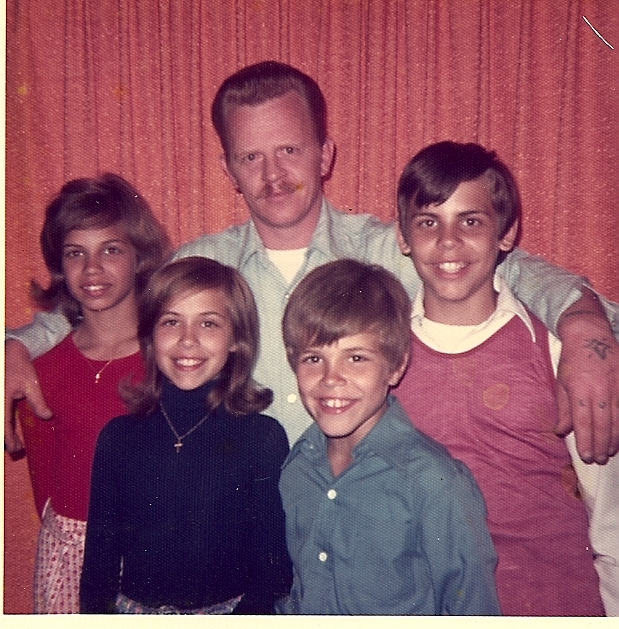 Today I dedicate my blog to my first love, my Daddy! Thank You for everything you were to me, I look forward to the time when we can see one another again. I miss you so very much. 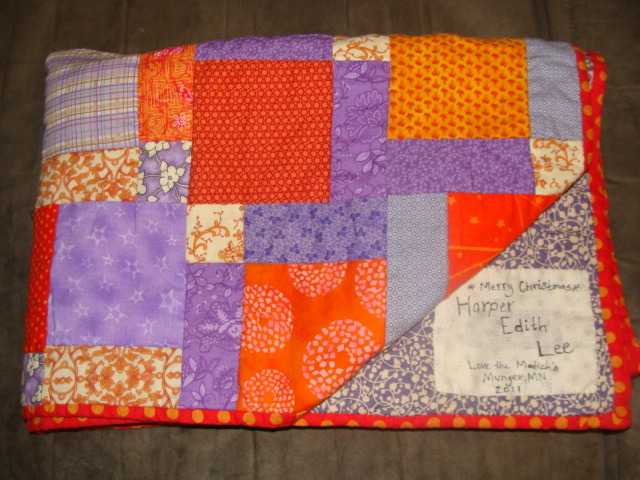 Kristi made this quilted pillow for a friend who comments on how she liked it. This is true selflessness, isn’t that the definition of a quilter? 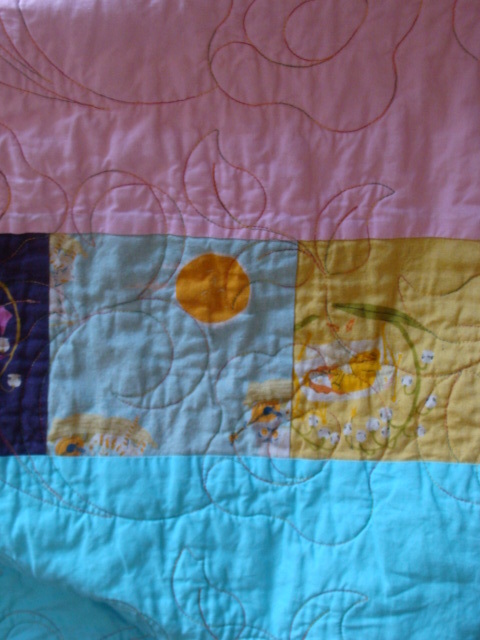 Now and then I create a quilt that really tells its own story. 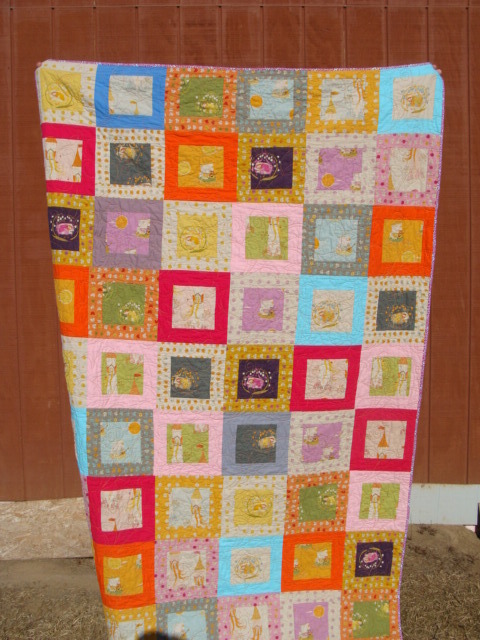 Approximately 3-4 years ago, I made such a quilt. 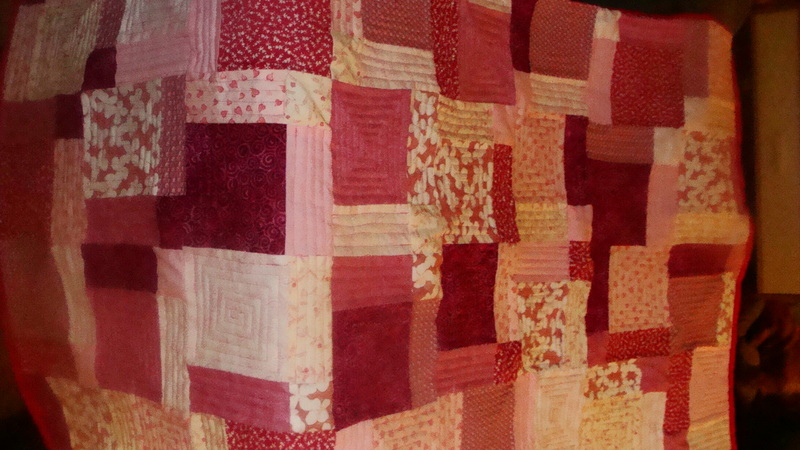 This quilt was made from scraps and told a love story. I brought it to a favorite salon, that I frequent for massage, for show and tell. My young massage therapist, Kristi, was absolutely facinated with it. We began to talk about the aspects of quilting and the great reward, as well as therapy that finishing a quilt brings to the soul. 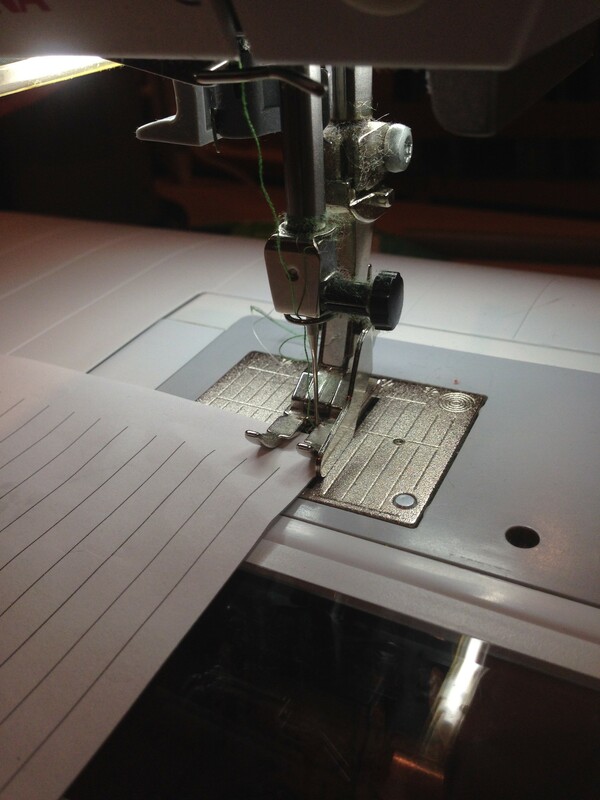 Kristi had an old machine that belonged to her mother, she had difficulty sewing with it, so I suggested she try a machine that I had in storage at home. The machine was a Janome 4800 computerized machine with so many stitches that I think Kristi was a little overwhelmed. She thought that the fact that it had the entire alphabet in 3 fonts was not too shabby either. After I saw her reaction, I could not help but simply gift her this machine. It was indeed one of the best investments I can say I have made in years. 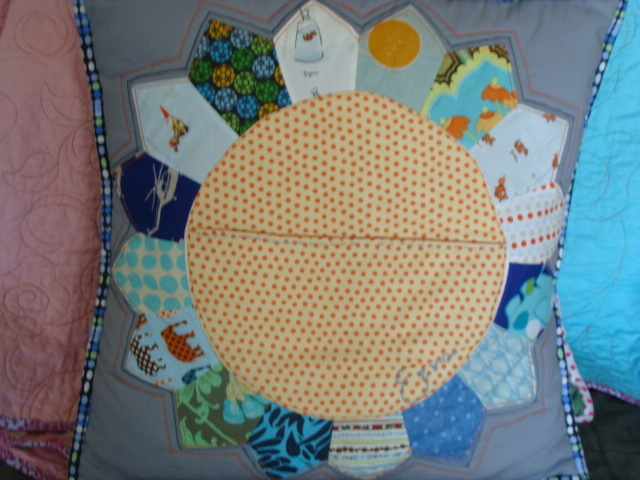 This young mother has created so many beautiful quilts, pillows, and misc items. It warms my heart each time she brings in another show and tell item, and the best part…. she gifts most of them. What a treat to have watched the birth of a quilter. She was kind enough to send me some photos via email so I thought I would share them with you. I am sure you will appreciate them as much as I have. She prefers quilts with a kick, no boring quilts from this girl. isn't this a great backing? Kristi also found very quickly that she liked certain designers, and she has consistently found new exciting fabrics to make her quilts. I am really proud of this young mom, who by the way is due to have a baby boy any day now. She is a real inspiration. I hope her story will inspire others to put the fear of something new aside, the world is your palate. It amazes me how many different and unique styles I see as I instruct quilting classes, and how inspired I become by my students. I want to give a special thanks to Kristi and her husband Casey for organizing the photos and sending them my way. And I would also like to publically wish them the best on the birth of their new son Ezra. this is such a fun pillow, it has a trick which make applique really slickKristi made this quilted pillow for a friend who comments on how she liked it. This is true selflessness, isn’t that the definition of a quilter? More and more machines carry an assortment of decorative stitches. These stitches can change the look of domestic machine quilting, applique, embellishment or binding. 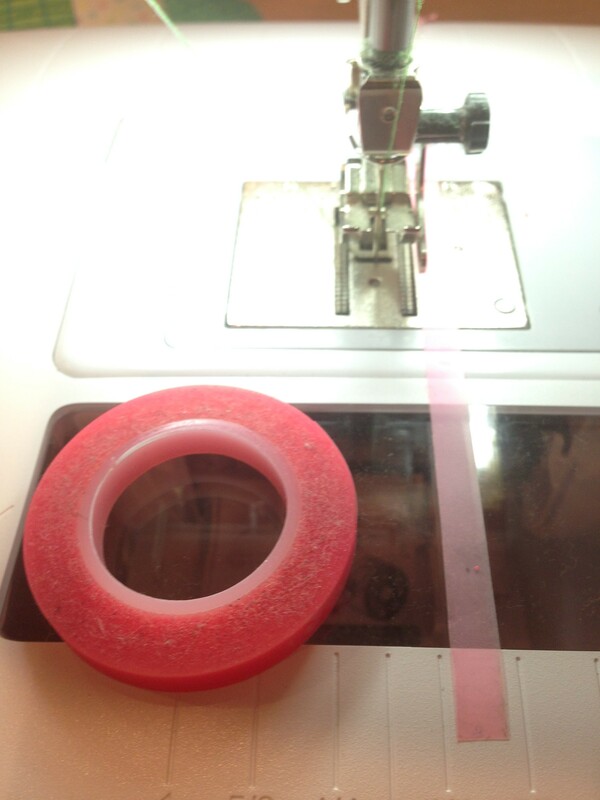 A great idea is to take a fabric sandwich, two pieces of fabric sandwiched around a piece of batting, and stitch rows of various stitches to see what your machine can accomadate for you. Now, adjust the width selector and do another row. Do you notice how that may change your stitches? Now fool around with the length dial, again you will see a change. These stitches can be used to give your quilt your own sense of style, you don’t have to get stuck in the rut of a straight or zig zag stitch. When you applique, try a decorative stitch other than satin or blanket stitch. You will be amazed at the wonders you can accomplish. It is your quilt, don’t be afraid to try something new for you. Once you are comfortable with the stitches, try different weight threads. If you have additional ideas on stitches, be sure to post it in the comments so we can share it with others. and a seam ripper with ergonamic grip.